This item is an online promotion and not displayed in the store at this time. All of our products are sold exactly as described and sold with money back guaranty. Please note that the order time is 6-10 business days from the invoice date for either pick up in the store or for delivery if requested. Availability is a subject to change. This sophisticated media console will add an understated look to your contemporary living room. The smooth top will accommodate your television, while two glass doors below offer ideal storage for electronics components, allowing you to use your remotes through the glass. 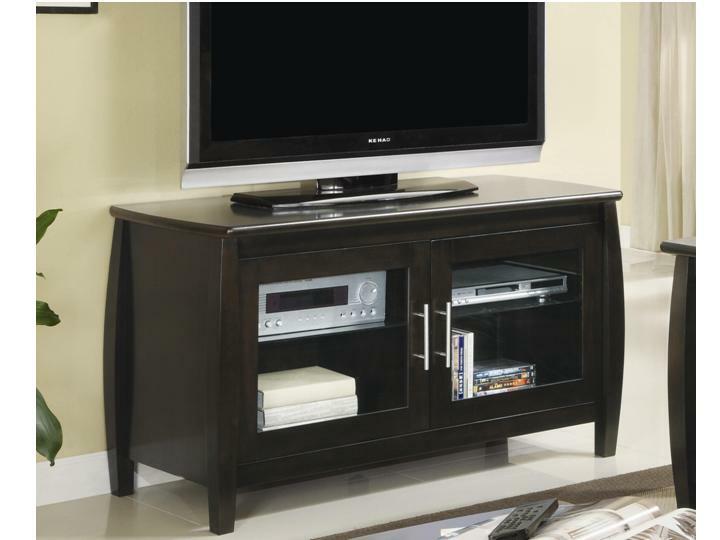 Clean lines on this TV stand create a chic style, with gently curved edges, all in a deep Cappuccino finish. Sleek silver tone metal handles complete this stunning look. Add this beautiful media console to your living room for an instant style update, with the benefit of great functionality.